World Wide Quilting Day is Almost Here! World wide quilting day is coming up on Saturday, March 17th. Like we need a reason to quilt! LOL! What will you do to honor the day? I will probably be in my sewing room working on a new project. Here’s a few suggestions to what you can do to celebrate the day. The obvious thing would be to work on a project. How about, instead of starting a new project, you work on a UFO? I know you have one or two ….. we all do! 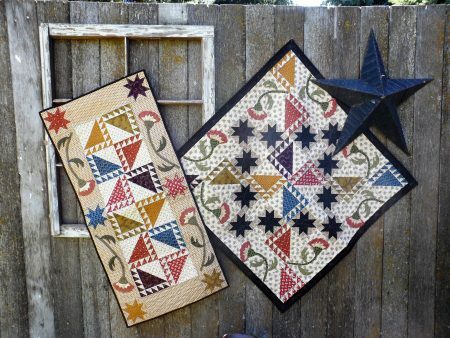 Get together with your quilting buddies to work on a project together. It’s always fun to hang out with friends and stitch. 4. Organize your fabrics. 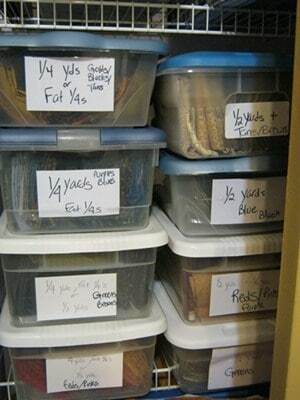 This may not sound fun, but as you are organizing you may discover some treasures. And that’s fun! 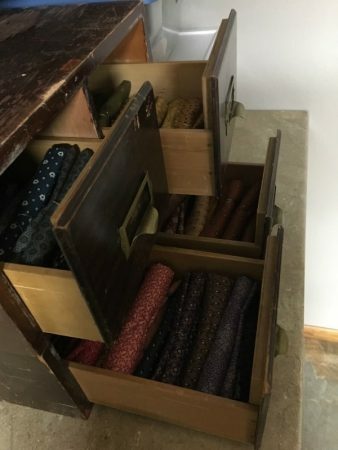 I can give you a little help with organizing your fabrics. 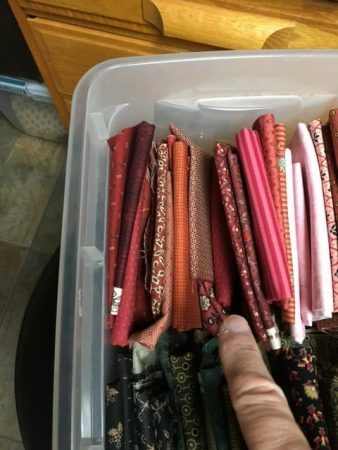 Since I’m a scrap quilter, organizing fabrics by color and size is a big help to me when I need to pick out fabrics for my next project. I like to “shop” my stash before heading to the quilt shop. Lord knows I love to buy more fabric, but I do not want to buy something I already have. By organizing the fabrics, I can see what I have and what I do not have. 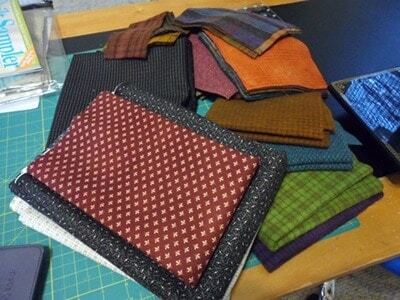 Larger cuts of fabrics, 1 yard and larger are folded and place in a cupboard. They are also organized by color. So what do I do with fat eighths? Well, I did a blog post on that: Taming Your Fat Eighth Storage. So, share with me what you are going to do this Saturday! And above all, have fun! Some people like to bind a quilt …. and some people don’t. Some people feel both ways! 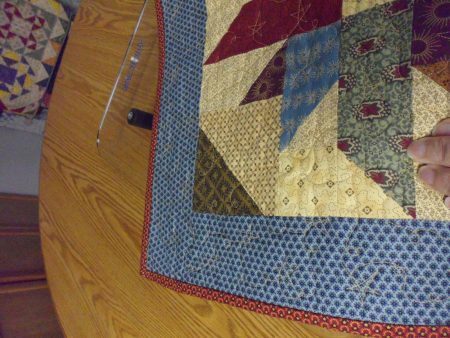 I like binding the quilt because it means my project is done and I can move on to the next. However, I am often impatient because there really isn’t too much creativity that goes into binding, unlike the quilt top. 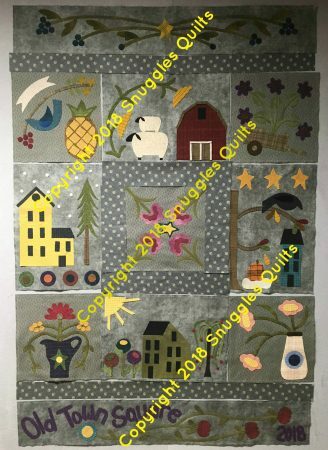 Sometimes in the past I found that I was so anxious to get the quilt finished, I would just slap on any color binding that didn’t “offend” the quilt. Now, it’s different! 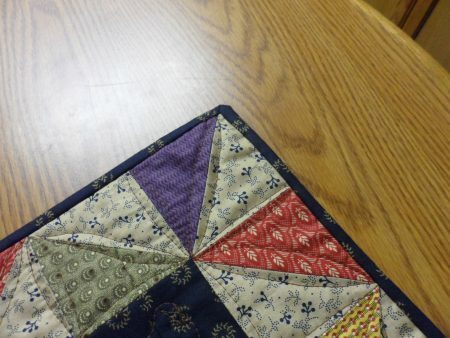 I now think of binding as sort of the last “frame” for the quilts I make. 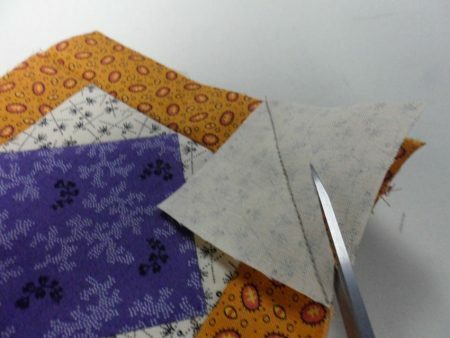 There are several ways you can enhance your quilt with binding. 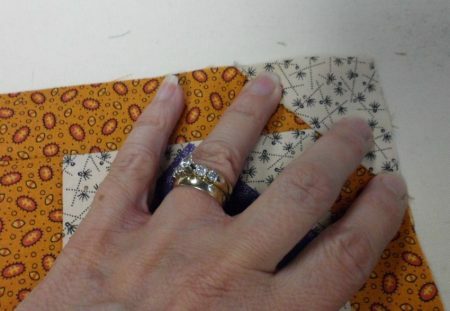 Or as another option, you can have a one color binding using your favorite color from the quilt. For example, if you have a red fabric in the blocks, you may want to call attention to that by putting on a red binding. It will appear that you are “pulling” that red out of the quilt for attention. 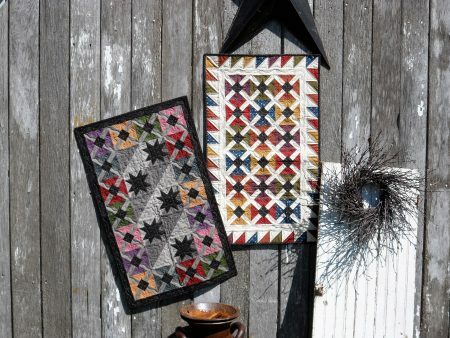 A final option I have used is a contrasting binding like using black fabric to frame a scrappy quilt. The black “outlines” my quilt! 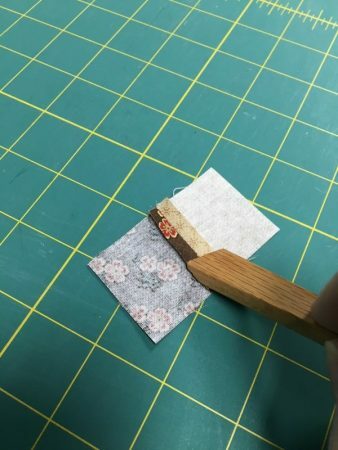 Finally, if you are more interested in having your binding just fade into the background, choose a binding that is the same color or close to the same color as the outside border of your quilt. Do you use single-fold or double-fold binding? That is usually up to the quilter. But, here’s how I decide to use it. I use single fold binding on quilted projects that will be mostly decorative, like wall hangings, candle mats and table toppers. 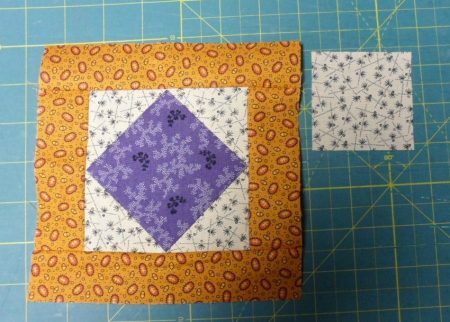 On quilted projects that may get more use like lap quilts and bed quilts, I will use a double-fold binding for more durability. 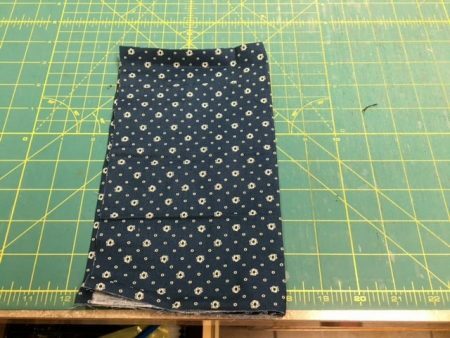 My single-fold binding is made from 1 1/2″ strips of fabric seamed together on the bias. 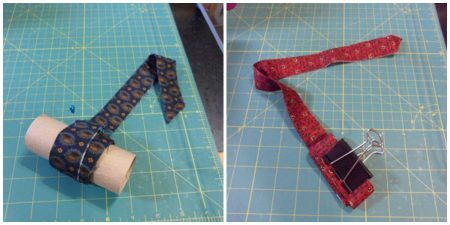 My double-fold binding is make from 2 1/4 to 2 1/2″ strips, seamed together on the bias and then pressed in half lengthwise. 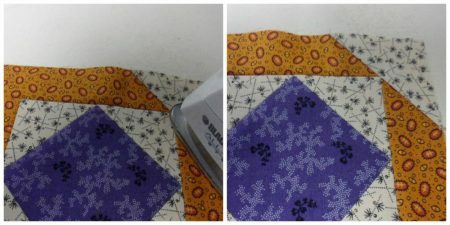 So you know how it’s really hard to wrangle long strips of binding while you are attaching it to your quilt? Well, roll up your binding around a cardboard toilet paper roll and secure it with a large pin to hold in place! You can also just roll it up and secure it with a large binding clip. This keeps it under control! 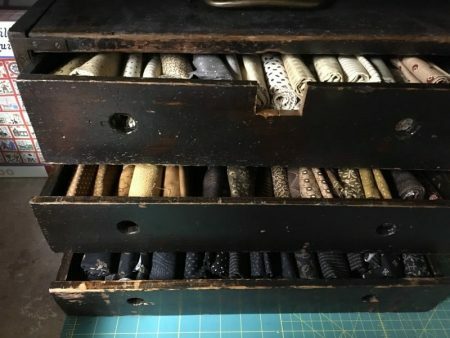 Do you have any tips or ideas to share on binding? Leave me a comment and be entered in a drawing for a 3 pack of my newest patterns! So, what are you waiting for? Time to tackle that binding! Get to work! 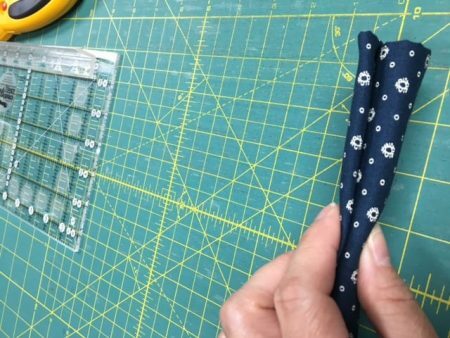 Do you want to tackle a new quilting technique that you have not tried before? Or do you just want to familiarize yourself with a technique you have not done in a while? Here is one that I like to use when making designing so quilt patterns. I am actually working on a new pattern right now with folded corners or, as some refer to it, “stitch and flip” corners. 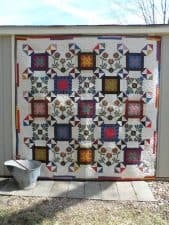 Since I am not ready to reveal my new pattern yet, I will use some blocks from a pattern I made a couple of years ago. A big part of the design uses the folded-corner technique to create it’s look. I thought I would share with you my folded-corner technique steps for the perfect corners. 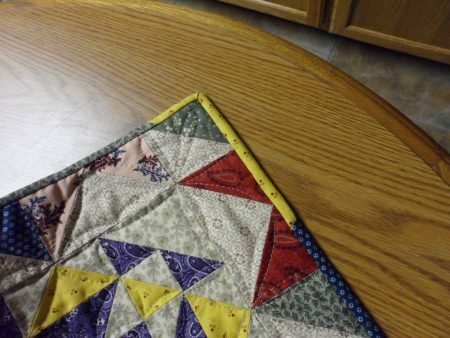 The key to perfect folded-corners is to not alter the size of the unit that you are adding these corners to. As you can see I have already used the technique for the center of this block and then added some borders. The next step is to use the folded-corner technique on all four sides of the unit before adding the next borders. Draw a diagonal line on the wrong side of the square as shown. This will be the sewing line. 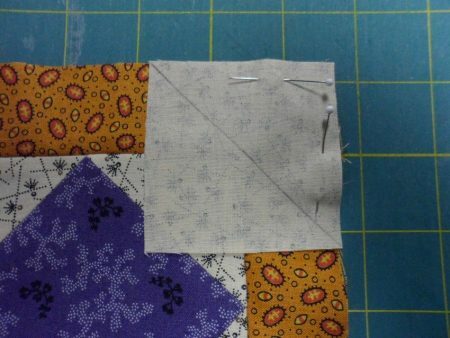 Next, lay the square face down on the unit you want to add folded corners to. Align the square’s edges with the edges of the unit you are stitching it to as shown. 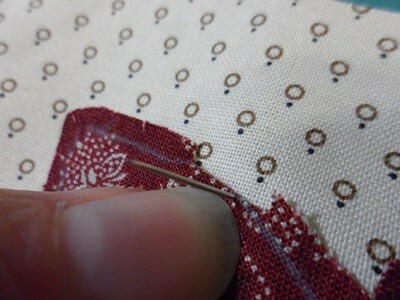 I use pins along the edges to keep the square from shifting while I’m stitching. I have found this step important to maintain the size of the original unit. Now stitch along the line. 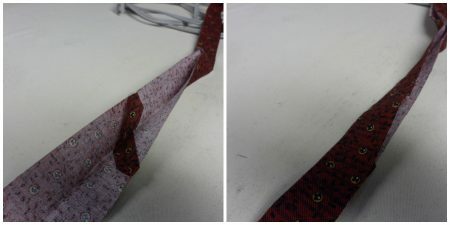 The next step is usually to trim away the excess fabric in the seam allowance, but I add another step here. I finger press the corner back as shown in the photo to make sure the corner created is in alignment with the original corner of the unit. To say it in simpler terms, with the corner pressed back, does the unit still look perfectly square and measures the same size as the original unit? 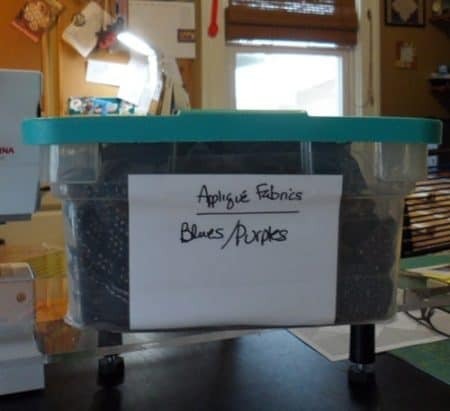 If any of the excess fabric shows then your unit may not measure the correct size. You will need to “unsew” the square and start over. If not, you can move onto the next step. 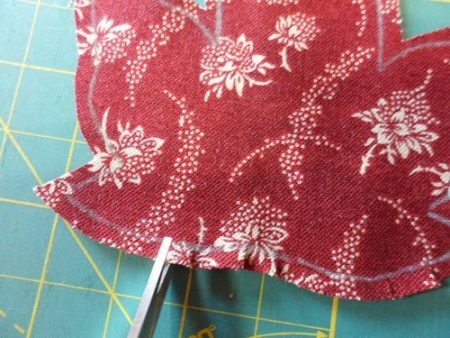 Trim the excess fabric from the seam allowance and press the corner open. And there you have it! A perfect folded corner. I always measure the unit as I add each corner to make sure I am not altering the size of the unit. Once I trim, then I can press open the corners. So now you can make perfect folded-corners! There are so many blocks that use this technique to create their design. 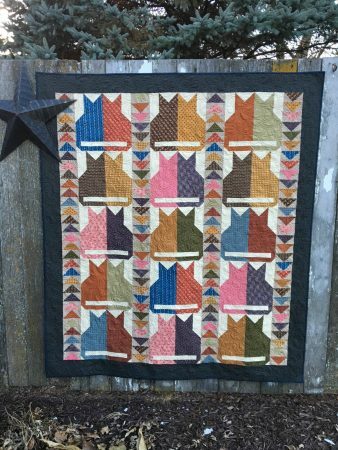 It adds a unique look to any quilt. At least I think so. Learning new to you techniques can be challenging. But the more you push yourself to learn new stuff, the more interesting your quilts will be! 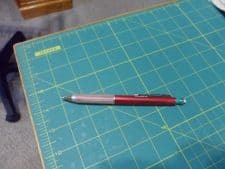 My Favorite Quilting Tools. How About You? 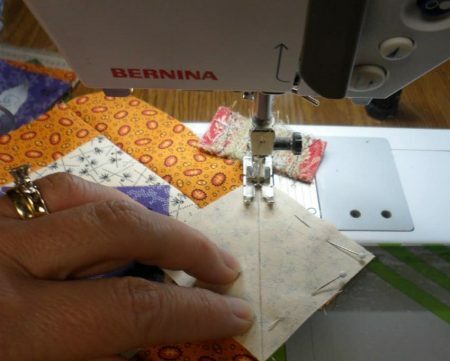 We all have our favorite tools we use when quilting ….. some we cannot live without and some that are useful, but we’d survive if we didn’t have it. Some tools are traditional ones that you buy in a quilt shop …. and some tools are things from your home that you use … even if quilting and sewing is not what it is intended for. Of course, we all have our mats, rotary cutters and favorite scissors. 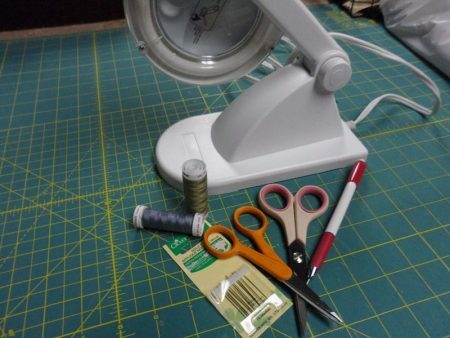 I’m talking about those tools that make some quilting tasks easier (or make them seem so!). If you look at my patterns, you’ll see I love scrappy and lots of small pieces. 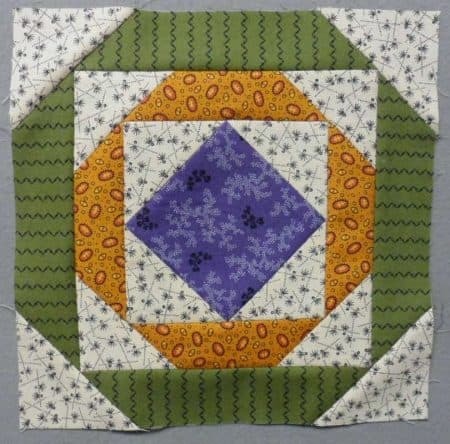 One of my favorite pieces to use in a quilt block is a half-square triangle square. 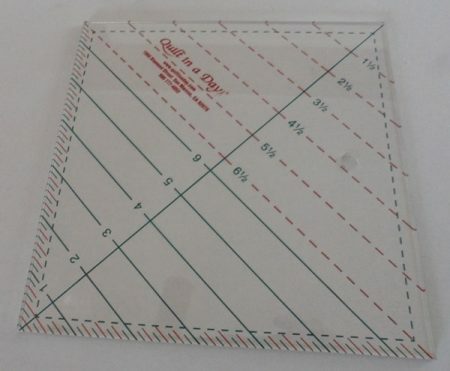 I used to make them, press them open and then trim all four sides of the square to make sure it measures the size I want. 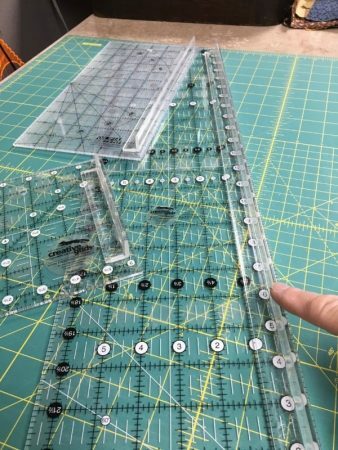 This tool makes the squaring up task easier by allowing you to trim the squares before you press them open. You only have two cuts to make instead of four! It may seem small …. but when you have a pattern with hundreds of these squares, it’s a time saver! 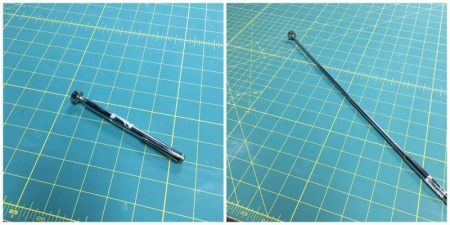 Another favorite tool of mine is this magnetic wand called the Pin Picker Upper to pick up dropped pins and needles. It telescopes out so it’s long and you don’t have to bend over to sweep the floor for pins. I drop a lot …. I mean A LOT of pins on the floor when I’m working on a big project. And since I like to walk around my room in socks …. I need to find these pins before my feet do! Next, is my pressing stick. 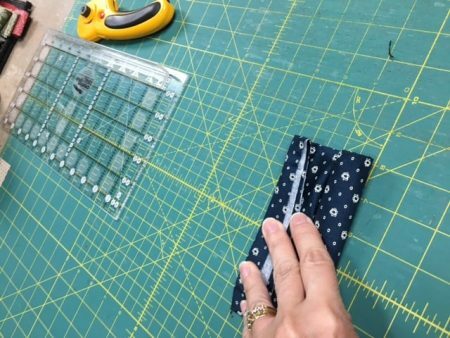 If I am piecing a block with many small pieces and don’t want to keep jumping up and down to press every seam, this is a handy tool! 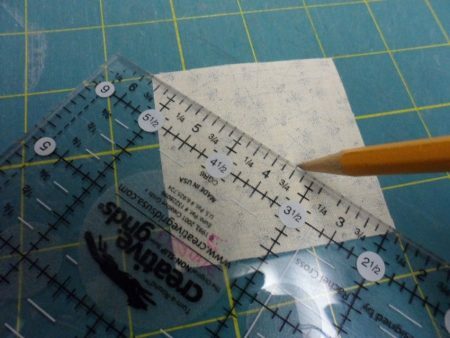 My last most favorite thing is this O’lipfa Rotary Cutting Safety Shield ruler guide for my long quilting ruler. 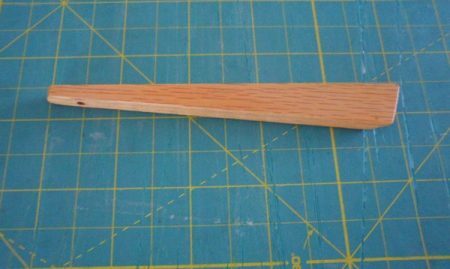 This is a great addition to your ruler. This keeps the rotary cutting from heading towards you hand if you slip while cutting. Since I sliced into a finger last year (ouch!) These guards have given me peace of mind. These guards combined with my “klutz” glove has really saved me from cutting myself again. Whew! My camera …. yes! Either the one on my phone or a traditional digital one. I like to take photos of different layouts when piecing a quilt top or figuring out the placement of appliqués. Then I can refer to the photos I have taken so I piece the blocks for a quilt top in the correct order! 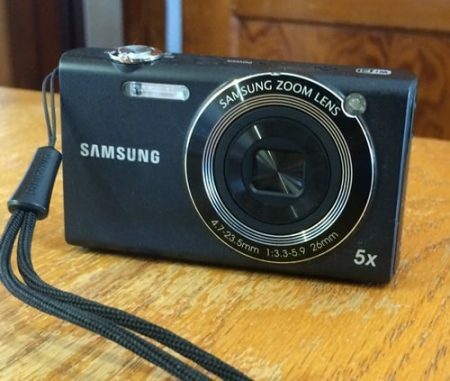 An inexpensive digital camera just for your quilting is a great tool! 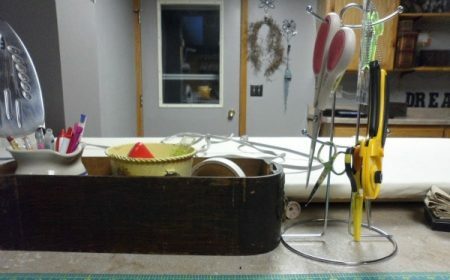 I also use everyday items to store tools on my cutting table. This is great storage for my pencils, small rulers and scissors. The item that my rotary cutter and scissors are hanging off of is an old coffee mug holder! 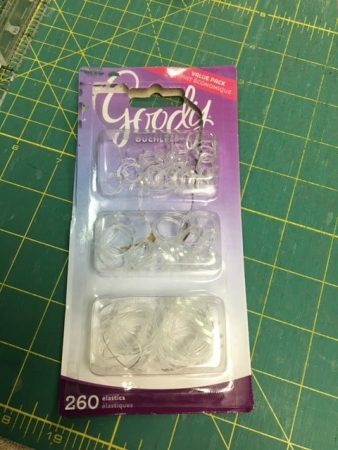 This last thing I use helps to keep the pattern I’m working on front and center in my line of site while I am sewing. A clipboard! 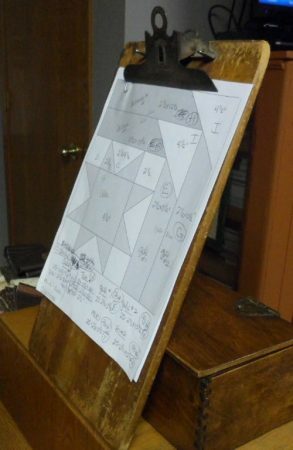 I found this cool wooden clipboard at a garage sale and thought it would fit in perfectly in my studio. If your sewing table is against to or next to a wall, you can even hang it on the wall. So, now that you’ve seen my favorite tools, share yours with me! Win a copy of my latest pattern, Scrappy Catz by sharing your favorite tools in the comments. Welcome back to my appliqué class here on the blog! When we last left off, the templates were prepared and shapes traced from fabric. The seam allowances have been clipped. So now what do you do? This is when we use the fabric glue! We need to position the appliqué where we want to stitch it …. but we don’t want it to move while we are stitching. Instead of using pins, I like to use the fabric glue we talked about when we began this series. See how I only use small dots of glue? 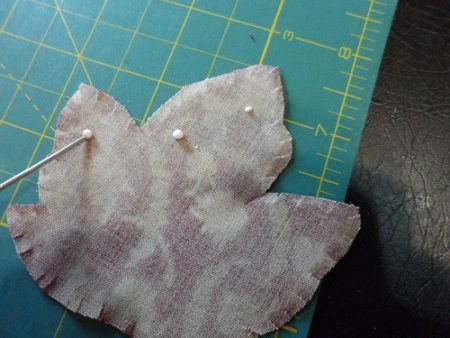 You do not want to use too much glue because it will bleed through your fabric and create a mess. Also, it’s less glue to worry about when we get to a later step. You can re-position the appliqué, but it’s a good idea to get it placed where you want it the first time. It takes about 30 seconds for drying time. 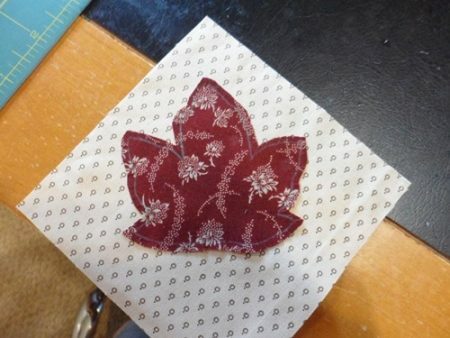 If you lift up the piece before the glue has dried, your appliqué may shift during stitching. Next, we move onto the appliqué stitch. The best way to describe your goal here is hiding the stitch. 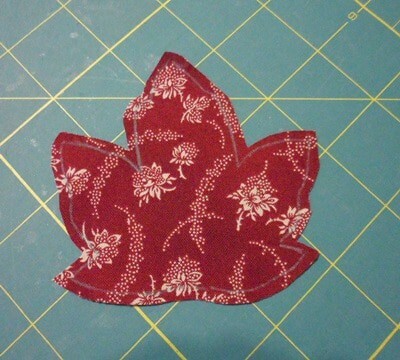 To start out, choose thread that matches the appliqué shape as closely as possible. As you can see, the color I picked matches the pretty well. 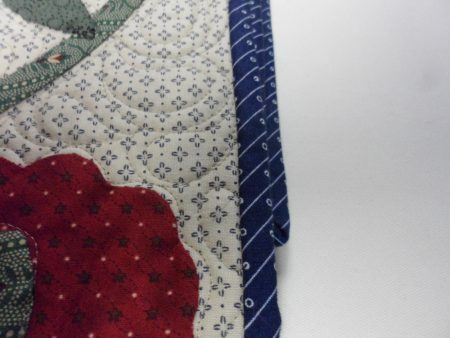 Now, the stitch that is similar to the one used when stitching binding to the back of a quilt, essentially a blind stitch. The following photos will display the stitch and how it should look. Above is the first step, coming up from underneath and catching the edge of the appliqués seam allowance. Next push your needle back down, in the background only, but right next to the place where your first stitch came up from the back in the first step. In the second photo above, you can see when you pull the thread all the way through, there is just a little “dot” of thread visible! Continue on stitching the way all around the shape. The stitches should be about a scant 1/8″ apart. Hopefully, you have enjoyed this brief appliqué series. 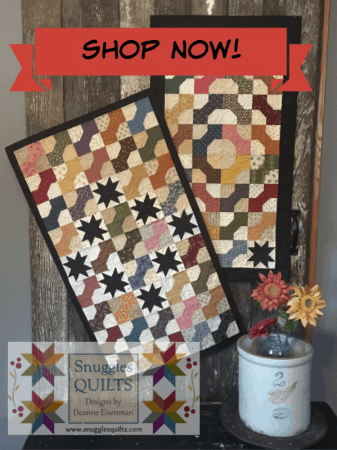 If you want an in depth class, I have one online with The Quilting Company! The name of the class is Sew-on-the-Go with Needle-Turn Hand Appliqué. It’s a 6 session course using my pattern, Bloomin’ Days. 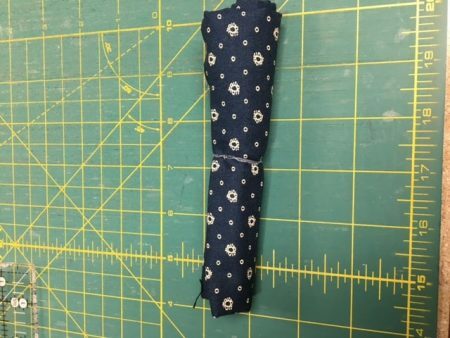 The pattern is free with the course! It’s fun! Give it a try! 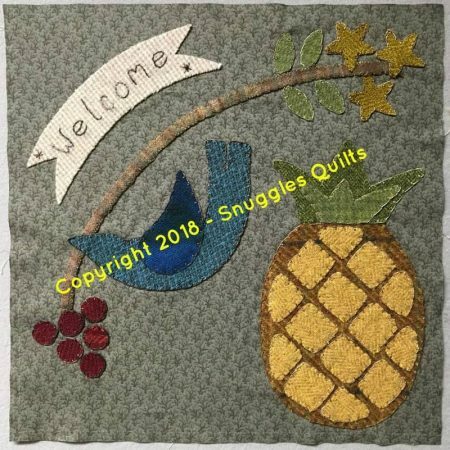 If you are just finding this blog, here are the links to the first two entries in this series: Applique is Fun! I’ll Help You Get Started and Applique is Fun! Part 2. So Cute! 2018 BOM Block 1 is Here! Today is the day that we kick off the 2018 BOM project with the first block! I you have not already prepared, here is the blog post from last week with the starter instructions for this project: Let’s Get Excited for the 2018 BOM! So, get stitching and keep an eye on my blog for more blocks in the future! Let’s Get Excited for the 2018 BOM! Hello! It’s getting close to that time….. 2018 BOM time, that is. Are you excited? I am really excited to share this new project with you and hope you will follow along throughout the year to make this. 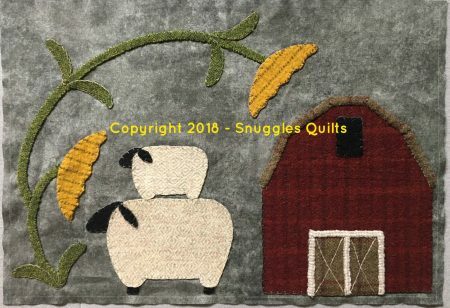 Once again, it’s a wool applique wall hanging. This one is called Old Town Square. Here are the blocks. They have been stitched but not put together yet. This just gives you a sneak peek. 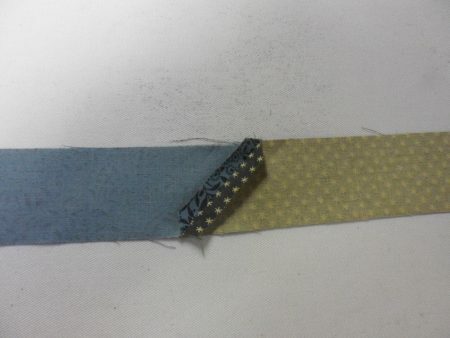 There are 11 blocks and for the final month (December) we will be adding embellishments to the sashing strips. 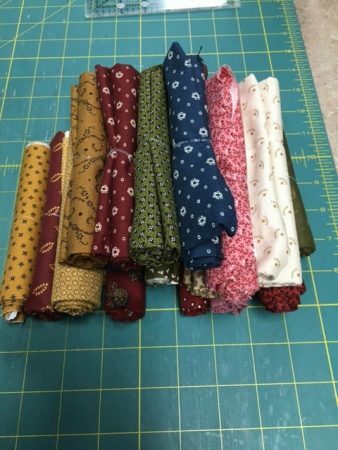 Here are the fabrics I used for this project. 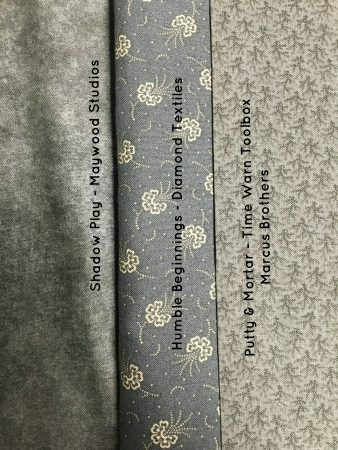 I am not guaranteeing you will find the same ones because fabric turnover in the quilt shops happens quickly, but this gives you the names in case some of the shops you frequent still have some. Use a combination of greys like I did or use a combination of your favorite fabrics! So, get prepared and watch this space on January 15th for the instructions for the first block! On December 20th, I posted the first post in this appliqué series. Here is the link to that entry if you missed it: Appliqué is Fun! I’ll Help You Get Started. So now let’s move to the next step in the appliqué process. Once you have gathered all your supplies, picked you pattern and fabric, it’s time to piece any background that is required and then prepare the appliqué templates. 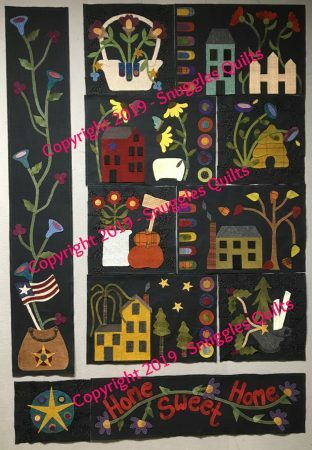 Some appliqué projects will have you stitching to a plain background to make a block and then piece those into a quilt. 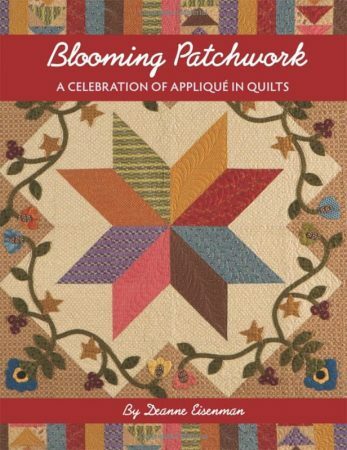 On my quilt, High Prairie Blooms, you see that there are appliquéd blocks alternating with pieced blocks. Then there are projects like my pattern, Fan Dance, where the quilt top is completely pieced and then appliqué is added in the border areas. No matter which type of project you are doing, these basic appliqué instructions will get you started. I like to copy my templates from the actual pattern either by tracing them (if they are in a book) or making a copy of the pattern page (if it’s an individual pattern). 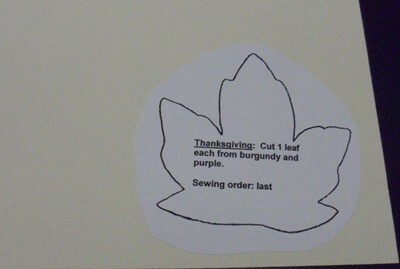 If you have access to a copier, make a copy of the templates directly on to card stock. 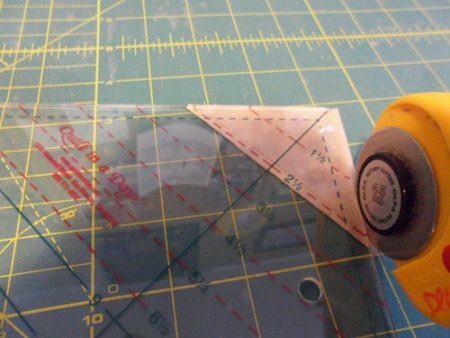 This will make the templates sturdier for tracing around. You will also be able to use them many times. If you are not able to copy right on to card stock, you can glue the paper copy to a piece of card stock (like the photo above) and then cut out the templates on the lines. 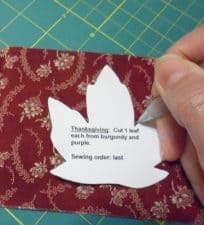 Always write on the template how many of the shape are needed and what color fabric is to be used, if it’s not already printed on the paper. Now it’s time to trace the shape onto the fabric. This is where I use the chalk mechanical pencils you can find in the quilt store. Some quilters like to use just the regular chalk pencils that you sharpen with a pencil sharpener. I say, use whatever you are comfortable with. Just make sure you can see the lines to follow for stitching. Once the shapes have been traced, you need to cut them out. 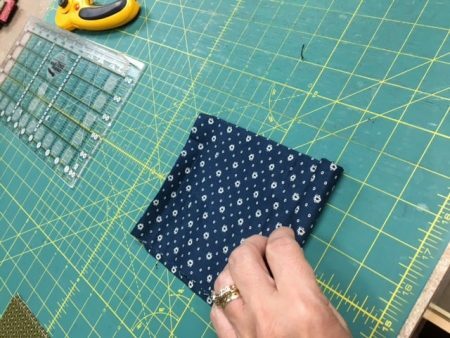 Cut them out using a scant 1/4″ seam allowance for turn under – the more experienced you are, the closer you can get to a 1/8″ seam allowance. 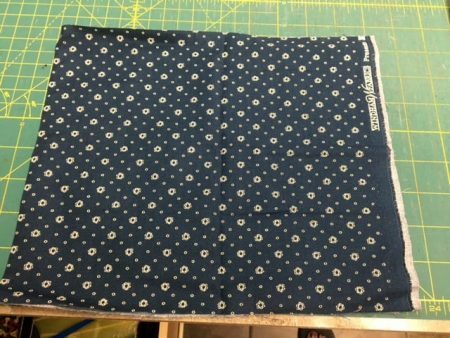 However, you do not want your seam allowance too narrow or your fabric can fray when you are stitching. Now, to prepare the shape for stitching, clip in the seam allowance a couple of threads short of the drawn line. You do not want to go over the drawn line since that will distort the shape of your appliqué piece. So, now you are ready to stitch! 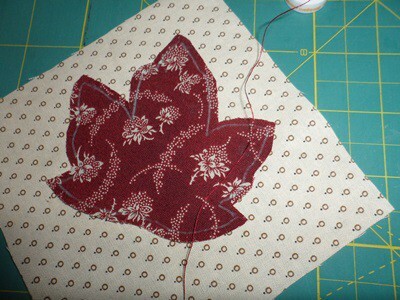 The next blog entry that I will post next week will be all about the appliqué stitch. Join me to learn the stitch and then get ready to make your own appliqué projects!